Falguni Shah is the only Indian nominee this year. Netizens have been breaking the internet ever since the news came out about Falguni Shah representing India and Indian immigrants in the US at this year’s Grammys which is slated to be held on February 11. Nominated for her album Falu’s Bazaar, in the Best Children’s Music category at the 61st Grammy Awards, Falguni has become every music lovers overnight sensation on the web. While the event is much awaited and is said to be aired in the country on Vh1 India, here’s feeding some of your curiosity. Known popularly by her stage name Falu, Falguni Shah is a Mumbai born, New York-based Hindustani classical singer who is famous for blending traditions of Indian classical and folk music with western pop, rock and electronic styles to create songs that explore themes of womanhood, romance, longing, love and loss. Her musical roots can be traced as far back as into her childhood when she developed a taste for classical melodies, listening to her mother humming to Ragas. Found in the company of RD Burman’s music and that of The Beatles since an early age, Falguni began her own journey in the field by training rigorously in the Jaipur gharana musical tradition and the Benaras style of Thumri, where she reportedly honed her talent for, sometimes as long as, 16 hours a day. She then polished her skills under the legendary Ustad Sultan Khan, the sarangi/vocal master and Kishori Amonkar, the legendary Indian classical vocalist, belonging to the Jaipur Gharana. Shifting to New York in 2000 and after an initial period of struggle, Falguni not only formed her own band under her stage name and performed at music venues throughout New York which started trending immediately among fans across the city but also collaborated with a wide array of high-profile international musicians like Wyclef Jean to lend her vocal style for Angelina Jolie’s directorial debut A Place in Time, Philip Glass, Ricky Martin, Blues Traveler, Yo-Yo Ma in The Silk Road Project and with India’s very own AR Rahman in Slumdog Millionaire. After she created a niche for her Indie-Hindi musical style in the Wall Street Journal as representative of a new class of musical hybrids, sometime around 2007-08, Falu went on to perform for the then President of the United States Barack Obama and First Lady Michelle Obama alongside AR Rahman in 2009 at first State Dinner in honor of the then Indian Prime Minister Manmohan Singh. Falu was named one of the 20 most influential global Indian women by the Economic Times of India in 2015 and later in 2018, she won the Women Icons of India award in Mumbai in the country. 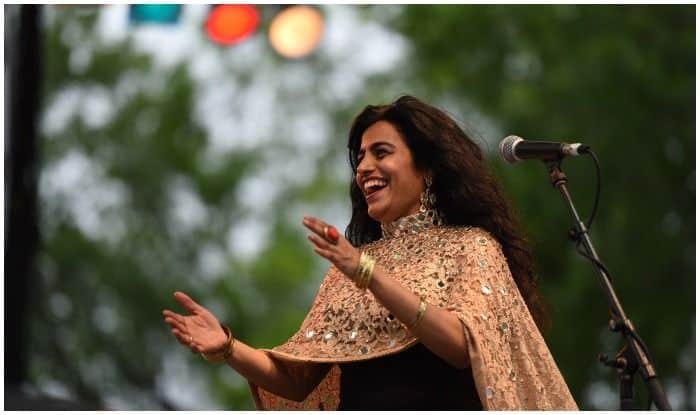 After having her son, Nishaad, the Indian-American musician set out to create one of the first South Asian music and culture projects in the market, Falu’s Bazaar, an album that is now in the race for a Grammy Award. With an aim to connect Nishaad with his roots and his culture, her Falu’s Bazaar is a 12 song album in English, Hindi and Gujarati which features her husband, singer-songwriter Gaurav Shah and Falguni’s classical singer-mother Kishori Dalal. Curated after Nishaad’s curiosity about language, identity and the food they ate home, Falu’s Bazaar overturns a lot of the stereotypes associated with conventional children’s music and exudes a great deal of depth and maturity. Falguni Shah is the only Indian nominee this year. Her Falu’s Bazaar is competing against Lucy Kalantari and the Jazz Cats for All the Sounds, Tim Kubart for Building Blocks, The Pop Ups for Giants of Science and Frank and Deane for The Nation of Imagine.